I have only had these lip balms for about 2 days, but I had to do a post on them for a run down of what I think so far and the great deal that they are this week. I went to Walgreens and this week (until 11/12) you can get this for free! Here's how: Buy it for $1.99 and you will get a $2 Walgreens Rewards for your next purchase. What a deal! Lip balm is an essential for winter, so now is a good time to stock up. Your probably wondering how good they are. Let me tell you more about the two lip balms. Revive & Restore, a dual solution that takes lips from dull and tired to healthy and refreshed. The Revive formula invigorates and protects lips, while the Restore formula makes them soft, healthy and radiant. The two unique formulas come in separate nesting jars that lock together. Whether carried alone or as a set, Revive & Restore delivers a customized two-jar rejuvenation approach that's as unique as an individual's lips. The Revive version is perfect to kick start the morning or whenever lips need refreshing. Revive contains the natural benefits of shea butter and fruit extracts to leave lips smooth and invigorated. It also provides dermatologist recommended SPF 15 for superb protection from the damaging effects of UVA and UVB rays. In the evening or whenever lips need to be softened and revitalized, the Restore formula can be used to combat rough and dull looking lips caused by the rigors of the day. Leveraging the anti-oxidant power of phyto-nutrients and nourishing Vitamin E, Restore helps make lips look healthy and radiant. I can't believe how well these lip balms worked for me and in a short amount of time. Let me start off with Restore. This one I used first because my lips have been super dry and I needed to extra moisture. I really like the way that it smells, it has a berry-like scent to it. I wish I would of took a picture of my lips before, just to show how dramatically different they are. My lips are softer, smoother, and are just.. amazing. Haha. The packaging is genius, being able to interlock to two together so you can carry them both if you want. Or just carry one and leave the other at home or wherever. Love that. The Revive is great as well, just a thinner consistency and has a spearmint smell to it. Definitely take advantage to the great deal at Walgreens. I'm actually going to go back and pick up a couple more before this Saturday! Oooh this sounds like fun. I too don't like balms in pots but am definitely intrigued. Thanks for the review. Recently picked them up, was more interested in good form factor/packaging but I am VERY surprised by how terrific these products are. Love 'em. The only problem is that they're ADDICTIVE. But I guess that's true of all lip balms. Depending on how old you are, you may remember children's liquid Motrin, a bottle of orange medicine that worked like ibuprofen, well restore smells spot on identical to it! Not that i'm complaining, honestly I like that it has that scent, anything that reminds me of my childhood is great! And I do enjoy the way this balm works, it is smooth and leaves lips soft and presentable. Revive, many complain, but I have nothing against it, though it may not have the same great smell, it is better medicated, which, in the long run will probably "Revive" lips in a more powerful way, giving it the name "Revive". But, children's Motrin all the way! 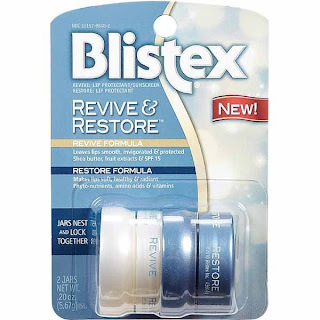 I had a bad experience after using Blistex Restore, my upper lip very swollen and I had to get medical help.